JSC Board Challenge Result 2018 system started. Check JSC Board Challenge Result 2018 publish date. JSC Rescrutiny Result 2018, JSC Khata challenge, JSC Rescrutiny Process, JSC Result Recheck Process, JSC Board Challenge 2018 and JSC Challenge Result 2018 will be publish here. You could finf JDC Re-monitoring. JSC and JDC Result 2018 published today, but it is a matter of great regret that, this result would be incidental to anyone. So what, don’t worry, you could be able to Re-monitoring or throw a challenge of your JSC and JDC Exam result of all subjects. Someone know as Board Challenge, Someone known as Rescrutiny and Re-check Exam result. How many subject for you want to apply Re-monitoring it’s depends upon your result and your wish. If your confident, you would get better result or marks then you can go to for Board Challenge. Here, we will show you the easiest way for checking JSC challenge result 2018. The JSC Rescrutiny Process 2018 for the Junior School Certificate examination students. Generally, every year a large number of students want to challenge his result rescrutiny process after publishing exam result. The passing rate of JSC examination is 89.85% and in JDC passing rate is 93.50% in this year. Average pass rate of JSC-JDC is 90.43%. On this basis average, 9.57% of students have failed. This article is for them who have failed in spite of being given a good examination or have not got his/her desired results. In this article, we will show you how to do JSC board challenge 2018 as well as how to check JSC board challenge result 2018. JSC & JDC Board Challenge Application will be started from 25 December 2018 and End on 02 January, 2019. Junior School Certificate (JSC) Rescrutiny Result 2018 is a one way method. 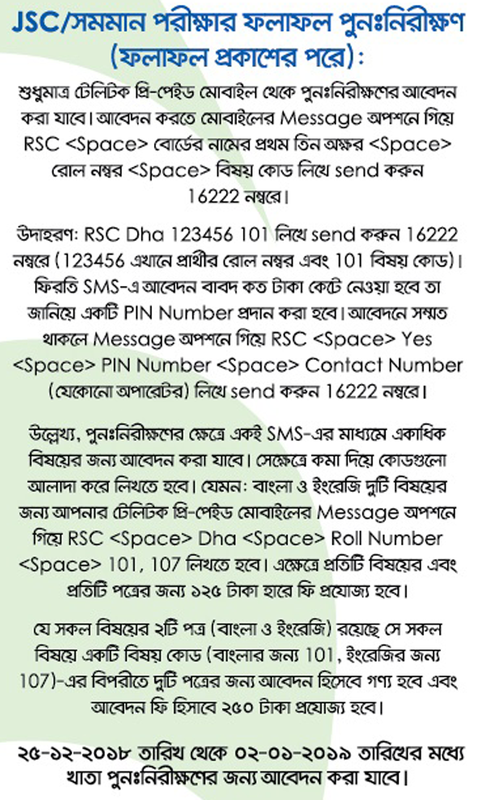 JSC Result 2018 Rescrutiny must have apply by SMS through Teletalk SIM. You have to pay 125 TK per subject, which is non-refundable. For Bengali and English Subject you have to pay 250Tk, which is non-refundable. Please follow the method below. You will receive an SMS with a PIN Number with application cost. If you agree then you have to reply to the SMS. Generally, JSC Board Challenge Result 2018 will be automatically sent to the number you have given for the contact at the time of applying the JSC board challenge 2018. If you change your number, which you provided during applying session. Don’t worry, here we will reveal the JSC Khata Challenge Result 2018 in pdf format. After the publication of Education Board official website, we will publish JSC Board Challenge Result 2018. If you are unable to download jsc rescrutiny result 2018, for you, we will show you how to download JSC Result 2018 Rescrutiny in several education board of Bangladesh. JSC Board Challenge Result 2018 Dhaka Board. Chattogram Education Board JSC Khata Challenge Result 2018. JSC Rescrutiny Result 2018 Cumilla Board. Rajshahi Board JSC Re-Monitoring Result 2018. Sylhet Board JSC Result 2018 Board Challenge. Download Dinajpur Board 2018 JSC Khata-Check Result. Check JSC Punonirikkhon Result 2018 Barishal Board. Jessore Board JSC Result 2018 Re-Scrutiny. JSC rescrutiny result 2018 of all board’s will published the results through this post after the publication of official announcement of Secondary Education Board. If you have any more question about JSC Board Challenge Result 2018, please knock in our Facebook Fan Page. If possible, we will help you on this regard. So don’t worry, inform us about JSC Rescrutiny Result 2018, JDC Challenge Result 2018, PSC Khata Challenge, SSC Rescrutiny Result, JSC Rescrutiny Result 2018.